Paul Strand is one of my favorite artists we have studied this year. He was born in 1890 in New York City, and was one of the beginning photographers who took photography as an art form. As he captured the energy and bustle of New York, his photos carried a message that would live forever. In 1915 he discovered the key capabilities of the large-format camera, known as “straight photography”. 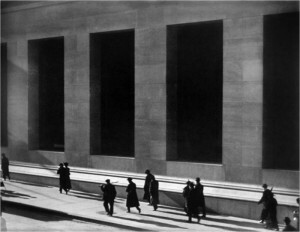 The photo, titled “Wall Street” was one of Paul Strand pictures that Stieglitz published in Camera Work (a photography magazine). Wall street was the nation’s financial center, and Paul was able to capture it in a certain light. Although simple, this photo changed American photography forever; Milton W. Brown once said that the photo “did much to lead American photography toward sharp-focus realism as well as abstraction, toward urban subjects and the machine aesthetic”. The picture doesn’t have much going on in it, but it tells a bigger story. First thing that comes to mind when seeing this picture is the grand background behind the walking people. It is your every day Wall Street building, but compared to the people it looks like a massive block. The building is a very solid color, which seems a little strange for buildings of the time. Usually buildings have windows or some glass, but this building only has big dark holes. Paul Strand likes to incorporate life with city structures, and “Wall Street” is his most famous depiction of the two togeather. All the figures in the picture are walking in the same direction, giving a sense that everyone is going to the same place, with the same, goal, and the same drive; to make money. What also stands out about this photo is the fact that the people seem to be leisurely walking. Wall street is a place of hustle and bustle, so it is strange to see a picture that doesn’t depict that movement and energy. Another important characteristic of this photo is the point from where it was taken. Paul Strand did not take this from a ground level, but he was elevated looking down on the men. This contributes to the size of the people walking. Because he was looking slightly down on them, it makes them seem even smaller than they already appear to be against the building. Being born in New York, Wall Street was a big part of the people who lived there’s lives. It was what drove the city and the country; practically the fuel to the countries engine. Paul Strands photograph will be looked at as a photo icon till the end of time. Gross, Garry. “Wall Street by Paul Strand” Icon Photos. 8/23/13 <http://iconicphotos.wordpress.com/2010/12/13/wall-street-by-paul-strand/>. Foundation, Apature. “Wall Street, New York, 1915” Artspace. 8/23/13 <http://www.artspace.com/paul__strand/wall_street_new_york>. I’m glad that you like the photograph, “Wall Street.” Your quotes from Milton Brown are excellent (although it is not clear what is the source for the quote). Noting the perspective of Strand is important and the ways in which the people relate to the massive background of the buildings. The fact that they are all going in one direction is also important (as are the shadows, which you don’t mention, because of how they contribute to the overall aesthetic of the photo). You don’t reflect at all on Strand’s background as the son of successful Jewish immigrants. This is an important piece of information that potentially influences how he comes to take photographs, images that he understands to be art. Next time, try to include another photograph or two that relate to the iconic one that you have chosen. Wall Street does change how we look at the street in part because of the symbolism associated with Wall Street, New York as the center of finance capital in the United States (in contrast to the Wall Street in Ann Arbor).